Hiking shoes – check. Water bottle – check. Sunscreen – check. Camera – check. 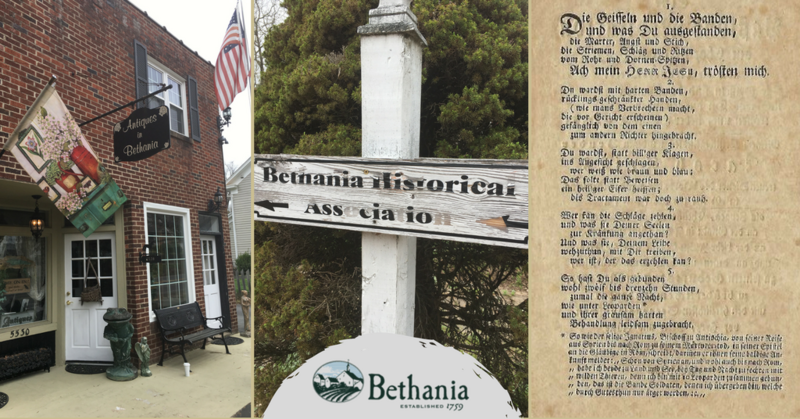 Now you’re ready to visit Historic Bethania. Those of us who love Bethania will have a chance to let everyone know why in May. The National Trust for Historic Preservation has selected May as “National Preservation Month.” Their campaign “This Place Matters” is designed to encourage local communities to share photos and stories highlighting the places they love. To encourage folks in the Piedmont to participate in this national project, Forsyth Preservation, a non-profit group dedicated to preserving local historic resources, is sponsoring a month of events about historic sites and points-of-interest right here at home in Forsyth County. Free guided walking tour of Historic Bethania. Free guided walking tour of Historic Black Walnut Trail. Lecture: “Remembering Daniel Boone in Bronze and Stone,” by Dr. Randell Jones. 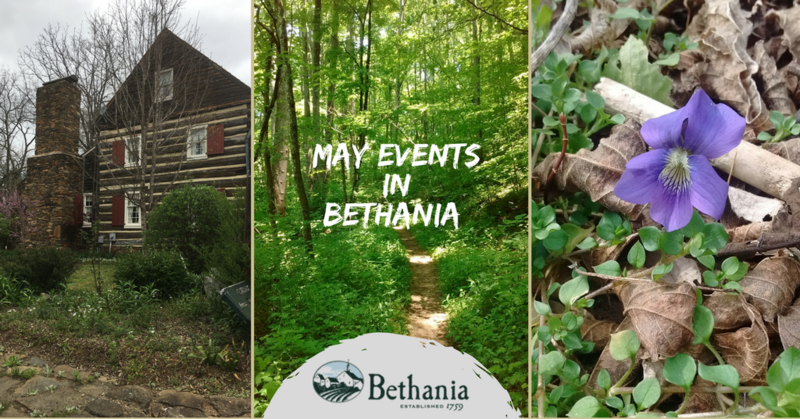 As anybody who loves Bethania knows, May is a beautiful time to poke around Bethania and enjoy the village’s trails, historic homes and shopping along with the Muddy Creek Cafe. The trails are especially pretty in late spring. With the foliage lush with new color and birds chirping in the background, it’s easy to imagine that you’re following in the footsteps of early settlers of Forsyth County — the Moravians. The Moravians were Protestants who immigrated from what is now the Czech Republic to the Colonies in 1735. In the Colonies, the Moravians established three villages in Pennsylvania — Bethlehem, Nazareth and Lititz. In 1753, they purchased 100,000 acres in North Carolina to expand the reach of the Moravian church and set about building farming and trade villages here. In 1759, the Moravians started Bethania, their second settlement in North Carolina and what was in effect America’s first planned community because the Moravian church purposely created a village where Moravians and non-Moravian settlers could live side-by-side. Bethania retains the Moravian influence to this day. The village has the distinction of being the only remaining independent, continuously active Moravian town in the southern United States. Established as an agricultural community, the beautiful 500-acre Bethania National Historic Landmark District is the largest such district in Forsyth County. Many of Bethania’s 18th and 19th-century homes and properties are listed on the National Register of Historic Places. 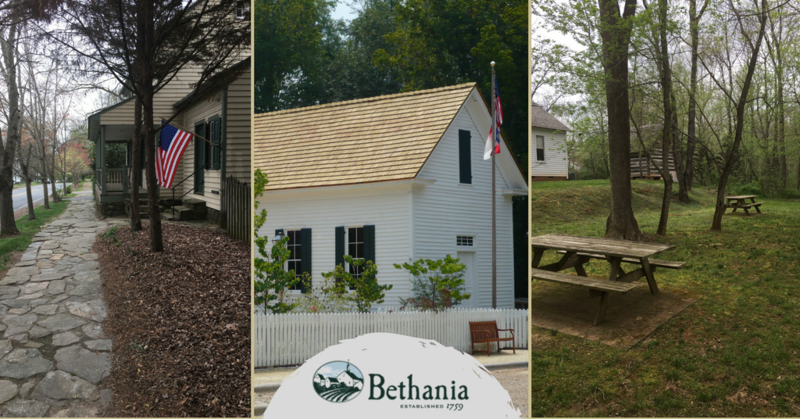 If you decide to go, the place to start is at the Historic Bethania Visitors’ Center. The center, located at 5393 Ham Horton Lane at the intersection of Main Street and Bethania Road, serves as an orientation hub for those wishing to explore Bethania’s National Historic Landmark District. Visitors can also get a tour map and additional information at the visitors’ center. One of the delightful additions to the center is a relocated and restored Moravian farmstead home called The Wolff-Moser House. The house, dating back to about 1792, is one of the earliest known surviving rural Moravian farmstead homes in North America. Across the street from the Visitors’ Center is the Bethania Mill and Village Shoppes, a small shopping area in a converted old seed mill. Visitors can enjoy a bite to eat there as well at the Muddy Creek Cafe. While you’re visiting Historic Bethania, take some photos and post them on and post them on your social media pages with the hashtags #historicbethania and #thisplacematters. For additional information, you may also visit the Forsyth Preservation website www.preservationmonth.org. The site also includes a detailed listing of all the local events relating to the celebration of National Preservation Month.